I can't make this post funny. If you're reading this because you've lost a loved one and don't know where to begin organising a Buddhist-meets-Western funeral in Australia, then this is for you with my sincerest condolences. 1. Contact your loved one's buddhist temple and ask them to recommend a funeral home OR contact a funeral home and ask them to recommend a buddhist temple. Sadly, people die every day so while it may be new to you, the monks and funeral directors have experience and can guide you. 2. I found this site very helpful with the steps you need to take immediately after your loved one has passed - http://www.funeral-info.com.au/index.php/what-to-do. 3. 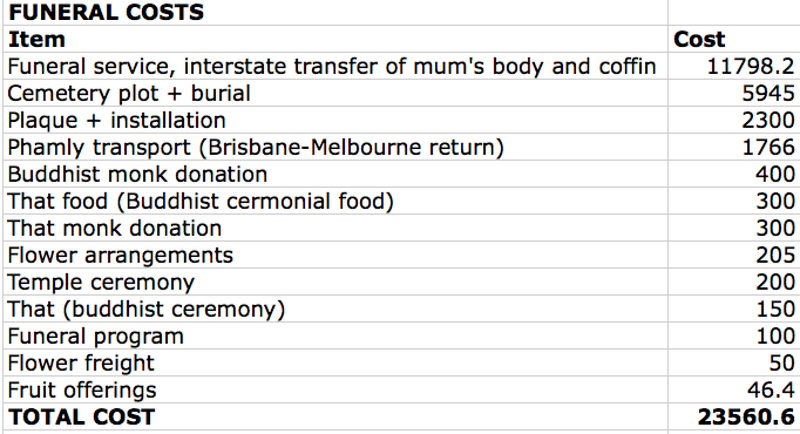 Funerals are insanely expensive. It will vary for everyone but hopefully my spreadsheet below gives you a basic guide on things to consider. I wish I'd had something like this to help me prepare. I'm sorry it took me 1.5 years to post this. It took a while for my grief to run its course. In loving memory of Mum Pham.